Based in San Clemente, California, Molecule is changing the game to keep athletes clean and care for their equipment. Proud to be fully made in the USA, Molecule manufactures hi-performance cleaners to help keep athletes clean and their gear protected. 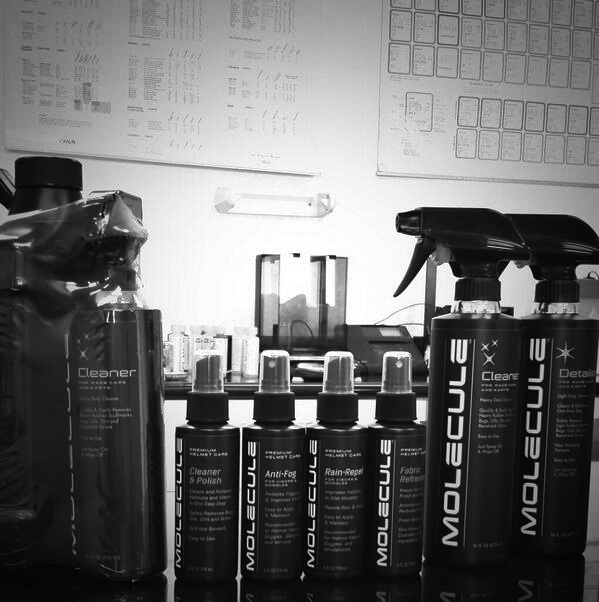 Originally founded as a solution for motorsports technical fabric care, Molecule now services a wide array of different industries. From an Indy 500 winning fire suit to your favorite hockey player’s gloves, or those musty towels at the yoga studio to first responders and their protective gear; Molecule is quickly becoming the most versatile cleaning company on the market. After years of development, testing in the lab and experience in the field, we’re proud of the performance of Molecule. We “Keep It Clean.” Plain and simple, no marketing gimmicks, no special tricks. Just awesome products designed for those who get out in the world and aim to perform at the highest level. With a foundation in place, the development has only begun as we strive to continue developing game-changing products for the motorsports, sports, snow, fitness and tactical industries. A California company through and through, we live all the products we manufacture. Whether it’s a racetrack, a swell rolling in, fresh powder on the mountain or a riding trail in the hills, we expect only the best when it comes to being able to Keep It Clean. If we wouldn’t use the product ourselves, we don’t waste your time by trying to shove it down your throats. We wouldn’t want to waste time using inferior products keeping our equipment clean and protected. Molecule is here to keep you out on the track, rink, field, mountain, studio, range…wherever you perform!